When five Belgian architects, Axel Cailteux, Celine Hautfenne, Delphine Termote, Amelie Schweisthal and Julie Neuwels, created MetamorphOse, the firm became an outlet for the young minds to rethink architecture on various scales. "As architects, we use in different firms and with different centres of interest, our combined experience of the city and existing or future urban assets to put forward contemporary, sustainable or ephemeral interventions," explained the architects. For their landscape installation in Beziers, France, which was created for Technilum, for the festival "Heureuse Coincidence," the architects have not created a new building volume or designed a large scale construction, but rather, "a simple gesture" that is just enough to make an impact on the way the space is perceived. Using mirrors, PVC spheres, and small phosphorescent balls, the installation’s abstracted cloud particles do not change the physical landscape, but merely the way we see it. Mirrors that are "positioned like morning dew on artificial blades of grass" return a deformed and reflected image of the environment. 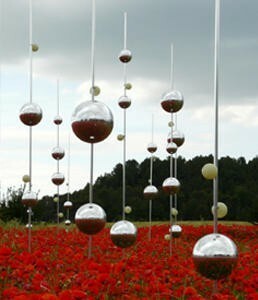 "By representing the environment in this way, each event is multiplied by its reflected image, a 360° mirror which also reflects the images reflected by the other globes, generating infinite reflections in a series of multiple, yet concomitant worlds," added the architects.